The land on which Beaulieu now stands was once a royal hunting lodge and the property of the Crown. In 1204, King John gifted the land to monks of the Cistercian order. The Abbey flourished, growing in size and status until the 1530s when Henry VIII launched the dissolution of the monasteries as part of his schism with the Roman Church. Beaulieu Abbey, with a value of £326, 12s 2d, was surrendered to the Crown on 2 April 1538. Like many other confiscated church lands, the Beaulieu Estate was sold to one of Henry’s friends and supporters and the government issued instructions that the religious buildings should be destroyed beyond the possibility of restoration. Thomas Wriothesley, 1st Earl of Southampton, took ownership of the 8,000 acre estate in 1538, paying King £1,340 6s 8d. A direct ancestor of the current owners, he converted the former Great Gatehouse into a modest manor house. Whilst rarely a primary residence for its owners, the estate was developed by successive owners – including John, 2nd Duke of Montagu, who in the 1720s founded the shipbuilding village of Buckler’s Hard on the estate. In 1867 Beaulieu received its first resident owner when Lord Henry Scott was given the estate by his father, the 5th Duke of Buccleuch, as a wedding present. Lord Henry, the present Lord Montagu’s great grandfather, was behind the transformation of Palace House into the family home that can be seen today. From these humble beginnings, encouraged by a new public interest in motoring heritage, the Montagu Motor Museum would develop. Supported by the British motor industry and enthusiasts, the museum continued its expansion, becoming the National Motor Museum in 1972. 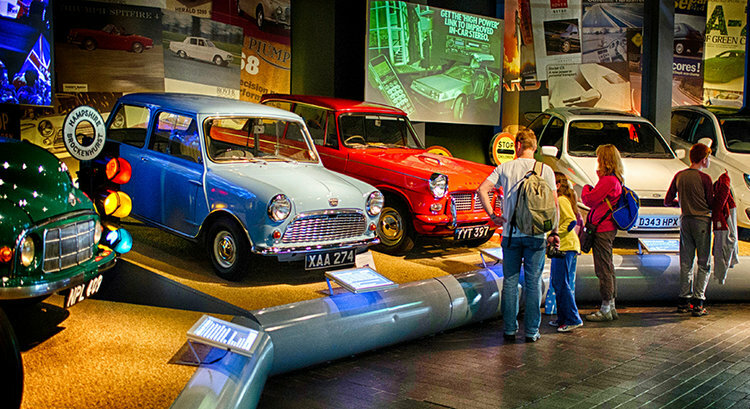 Since 1972, the National Motor Museum has been governed by The National Motor Museum Trust, an independent charity. It boasts a world famous collection of vehicles and associated motoring archives. Today, Beaulieu is one of the leading visitor attractions in the UK, a member of Visit England, Tourism South East, Hampshire Top Attractions, Treasure Houses of England and the Historic Houses Association.